With over 20 years of service to our customers, our goals remain the same: a good deal, a fair shake, and better service with quality products at competitive prices. That's what JD Defense is about - today, yesterday, and for the future. Located in rural Sussex County Delaware, JD Defense provides all forms of defense equipment and training for individuals and professionals. Sales include every major brand of firearms, ammunition, and professional defense products. Our instructor is FBI certified with over 20 years of experience training 21 law enforcement agencies and thousands of private citizens. If you have never visited or tried a shooting range because you visualize a group of Rambos running around acting macho , you will be pleasantly surprised. We take great pride in providing an atmosphere your whole family will enjoy. Located on a beautifully landscaped farm, your experience will be both relaxing and enjoyable, free of stress and full of great people who are there for the pure enjoyment of improving their marksmanship in a scenic country environment. We are open Monday through Saturday from 9:30 a.m. until 5:00 p.m. and Sunday from 2:00 p.m. until 5:00 p.m.
You won’t be disappointed with the new M&P pistols from Smith and Wesson! Smith and Wesson took the best features of their existing models, incorporated some of the best features from competitor’s firearms, blending them together into the new M&P line. The price is right too! I had the pleasure of shooting both the 9mm and .45 models with some very pleasant results. 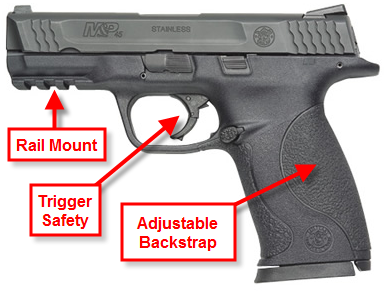 All M&P models come with three different sized backstraps to fit any palm. Changing them is extremely easy; eject the magazine, ensure the pistol is unloaded, turn the frame tool (next to the magazine slot) 30 degrees, pull the tool out, swap the backstrap and replace the frame tool. All done in under a minute. All M&P models also have an equipment rail mount for adding tactical lights, lasers or other items. I like this because at night, I slip on a tactical light in case I should ever need it. During the day, I slip the light off and it is back to a concealed carry pistol. Breaking the pistol down for cleaning is also a breeze- lock the slide back, flip one leaver, push the sear deactivation lever with the frame tool (or a pen, stick or other clean item), release the slide and it comes off. Again, all done in under a minute. I’m getting impressed and I hadn’t even shot the pistol yet at this point. The M&P 9mm full-size and compact models were both very comfortable to hold and easy to operate. Maintaining target sighting was very easy because recoil was light. My groupings were around an inch at 7 and 12 yards- and that’s without me having shot anything for a couple of months. I loved shooting it and easily recommend the M&P 9mm pistols to anybody looking for a great pistol for both target shooting and self defense. Now, any of you who know me also know that I favor .45 caliber pistols. I waited patiently until the .45 M&P compact became available in August and purchased one of the first ones to hit the streets. It has the features mentioned above, so I won’t repeat myself. As for shooting, WOW – I loved it! Even in the compact model, recoil was minimal (for a .45) and I had no problems shooting tight groups as I did with the 9mm. While my daughter was shooting on the rifle range, I took a moment while she was reloading to shoot the M&P45 compact at the 25 yard target (75 feet) and put eight rounds within 4 inches. Prior to the M&Ps, I was a diehard Smith and Wesson Chiefs Special .45 fan and you couldn’t talk me into switching it to another concealed pistol. That changed – I now carry the M&P 45 compact. We're now a Rohrbaugh Firearms distributer! Constructed of stainless steel and aircraft aluminum alloy for low maintenance and rust-resistant properties against moisture and perspiration. Small enough and light enough to carry unconstrictively at all times. Easy and fast to get into action. Devoid of any sharp edges, so as to not wear holes in clothing, handbags, etc. Mechanism is simple and easy to dissemble and reassemble soproper maintenance can be done by anyone. The slide-to-frame fit is designed to keep dust and lint out of the mechanisms. 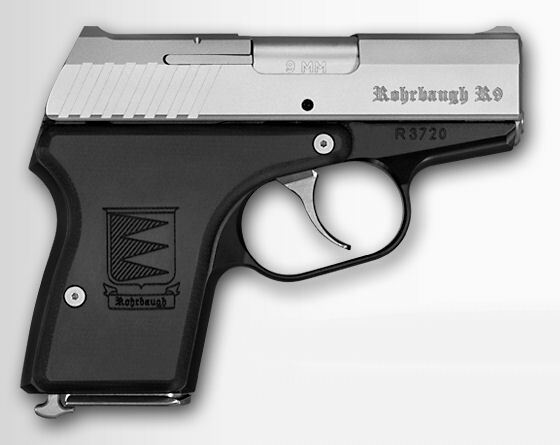 If you're interested in one of the most compact and high-quality self defense firearms available, make sure you see the Rohrbaugh models, available in .380 and 9mm! For more information, you can also visit Rohrbaugh Firearm's web site. We're a Heny Repeating Arms (rifle) distributer! Henry rifles are considered by many as heirloom quality - isn't it about time you added one to your collection? For more information, you can also visit the Heny Repeating Arms web site. You asked for it - we now have it! Because of popular customer demand, JD Defense now sells t-shirts, polo shirts, sweatshirts, hoodies, and jackets- all with the JD Defense logo! For more information, visit our clothing page! We Now Sell Taylor's & Co., Inc. Firearms! Taylor's & Co. makes it easy for you to own replicas of the most famous black powder firearms that ever saw military or civilian service at the hands of some of the most legendary figures in American history. Their lines include single action, conversion, top break, and open top revolvers, lever-action, slide action, single shot rifles, and coach guns! To see the various models, click on their logo below! Looking for a Quality Derringer? We Sell Bond Arms! We now sell the award-winning Bond Arms derringer -- the finest in double barrel protection! You'll find a line of customized products as well as a line of accessory products such as holsters, extended grips, and additional caliber offerings.To see what we offer, click on their logo below! AN ACT TO AMEND TITLE 7 OF THE DELAWARE CODE RELATING TO HUNTING. We have been hard at work redesigning the range to provide an even better experience for our customers. Improvements include expanded facilities and improved target backstops. Over the past two months, we have created and tested several new backstop designs- finally arriving at one that is more durable and easier to use for our members. Members who have used the new backstops love them. We have also doubled both the pistol and rifle range areas and will continue expansion to ensure customer comfort and ensure you can go straight out on the range and shoot anytime without waiting. John Davis (JD) began in the 70’s serving in the Army and Army National Guard. After that JD joined the Georgetown Delaware police force. During this time he was given the opportunity to attend the FBI Firearms Instructors Course. He enjoyed that training so much that he became a firearm instructor. At one time he was training 21 police departments in Sussex County. 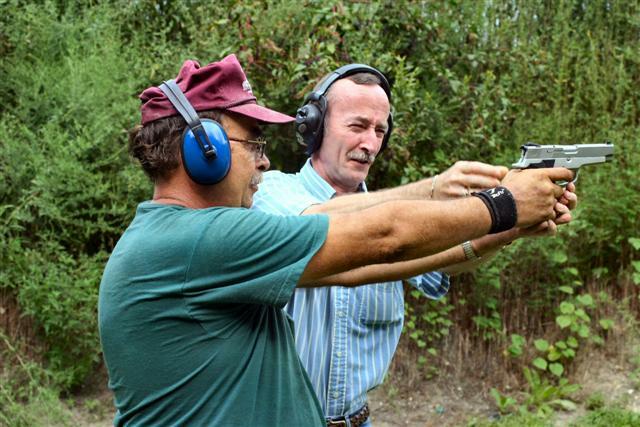 JD received his Federal Firearms License and was able to offer ammo with his training. The path from conducting training led him to selling firearms. In 1995 he began teaching courses on firearms training and safety at Delaware Technical & Community College, Georgetown Campus. He continues to teach courses at Del-tech. In 1995 the Delaware Superior Court deemed him an expert witness in firearms. Students are given personalized instruction with no questions left unanswered. No matter what skill level or previous experience, John has an uncanny knack of making students feel comfortable and confident. For increased comfort, John also instructs female-only and personal classes upon request. If you have any questions, please do not hesitate to call us!